A Team of five Development & Investigative Journalists based in Northern Nigeria have been recognised and awarded certificates and plague for service to humanity based on stories they did that brought to limelight challenges faced by communities in the country. 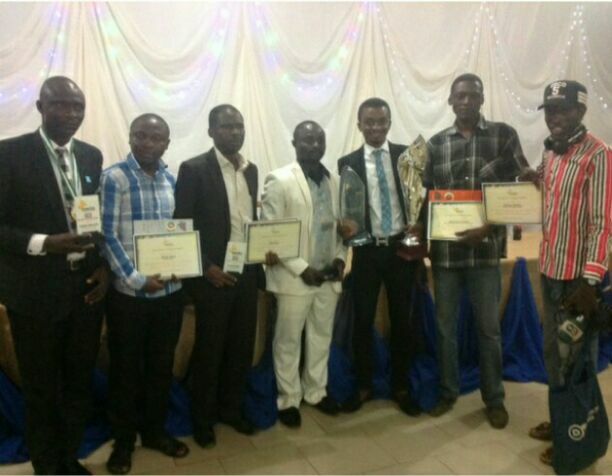 The award was presented by a student entrepreneurial organisation, ENACTUS, Kaduna Polytechnic branch. ENACTUS and the Team of journalists first met after a story on a community called Ungwan Kanti in Rigasa, Kaduna State, Northern Nigeria – the community was without pipe borne water, and depended on a pond for water to drink and other domestic purposes. The community also had no healthcare facility. After the story, ENACTUS took intervention to the community and constructed the first Sand Dam in West Africa. Team Leader of ENACTUS, KadPoly branch, Emmanuel Adikpe said, they were happy to have met the team of the journalists who dedicated so much to community development, as well as supported the work of ENACTUS. “When we visited media organisations for programmes, hundreds of thousands of Naira were quoted to us, but these ones came to our doorstep looking for us, to showcase our work to the world at zero Kobo. “They have reported on people from the grass roots who were in dire need,” he said. The recipient journalists were Iliya Kure of Voice of America; Ibrahima Yakubu of Deustche Welle ( Radio Germany); Mohammed Ibrahim of People’s Daily Newspapers; Bashir Bello of Nigerian Pilot Newspapers and Christiana Alabi of Daily Trust Newspapers all based in Kaduna. Speaking on behalf of other award recipients, Iliya Kure said the award came as a surprise – they never expected it, because they were just doing their work. “We never expected this, as far as we are concerned, we are just doing our normal journalism work. Of course we know that we go an extra mile, where other journalists don’t go,” he said.